Back in early March, I announced a fundraiser I was taking part in. Since then, the fundraising has continued and I am happy to announce that you – yes, YOU – can help, and help yourself… because who doesn’t like stuff? A Picture is Worth 1000 Words is officially available in paperback and ebook on Amazon. 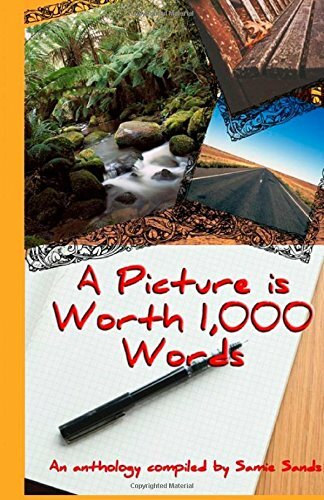 This is a story anthology wherein 18 writers answered the challenge to create a short story based upon a single, seemingly random image gifted to them for the sake of inspiration. It was a wonderful and frustrating challenge, and I think it resulted in some wonderful stories. The best part is that when you buy a copy, you are not only buying yourself the gift of reading (Fact: there are not enough full bookshelves on this planet) but your purchase benefits the Polycystic Kidney Disease charity. I will, at some point in the future, release my story Lake Effect here on the site for all to read. But for the time being, it will only be available through this anthology. This entry was posted in Announcements, anthology, book release and tagged amazon, andy lockwood, anthology, awareness, charity, horror, michigan, PKD Charity, polycystic kidney disease, samie sands, short story by randomgauge. Bookmark the permalink. Andy, you are fantastic. Congratulations on your newest published work!